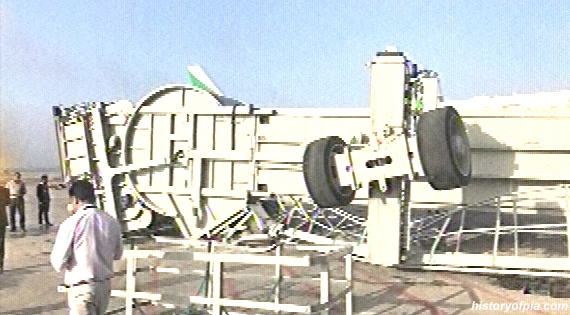 Passenger boarding bridge crash at Islamabad International Airport. Such a shame. Who installed this. Adelte group? Last edited by ammad on Tue Oct 09, 2018 10:21 am, edited 1 time in total. 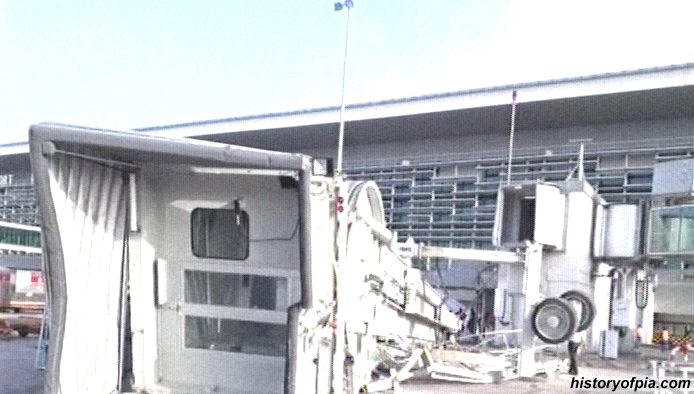 The boarding bridge crashed when it was being moved away after serving Gulf Air Airbus A330-200 registration A9C-KC. 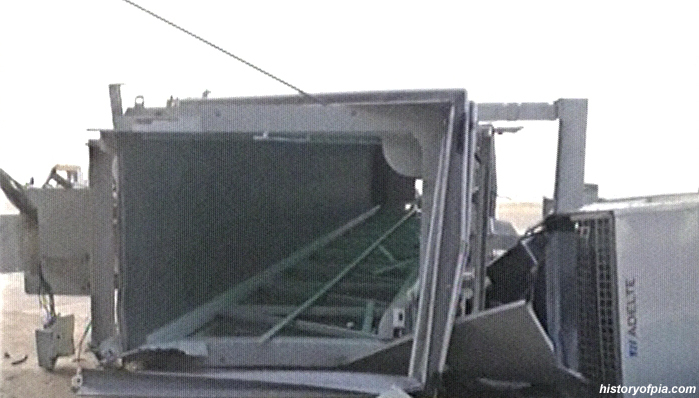 An operator of the boarding bridge manufactured by ADELTE is injured and shifted to a hospital. 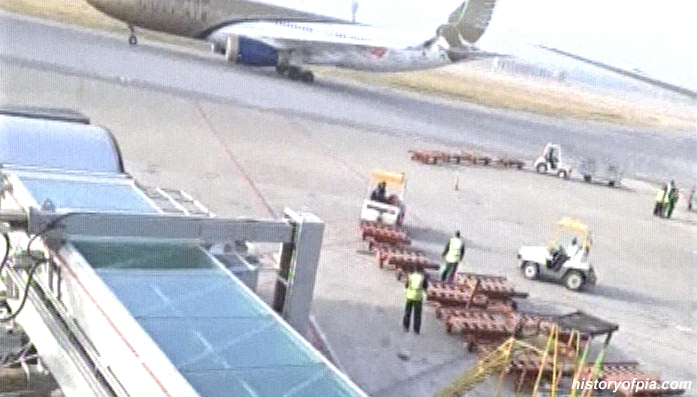 Luckily, the Gulf Air A330 remained safe and departed from Islamabad at 7:39 AM as flight GF-771 to Bahrain. The flight's scheduled departure time was 7:05 AM. Emirates Boeing 777-31HER registration A6-ENY seen in the background. The aircraft had arrived in Islamabad at 7:21 AM as flight EK-612 from Dubai. Another view of the crashed boarding bridge. It was aircraft parking bay number four boarding bridge, according to news sources. So "Adelte" (http://www.adelte.com/about-adelte/our-history) boarding bridges are not good and reliable? Someone over Facebook is also highlighting the operator's negligence. Lets see what findings come out to be. 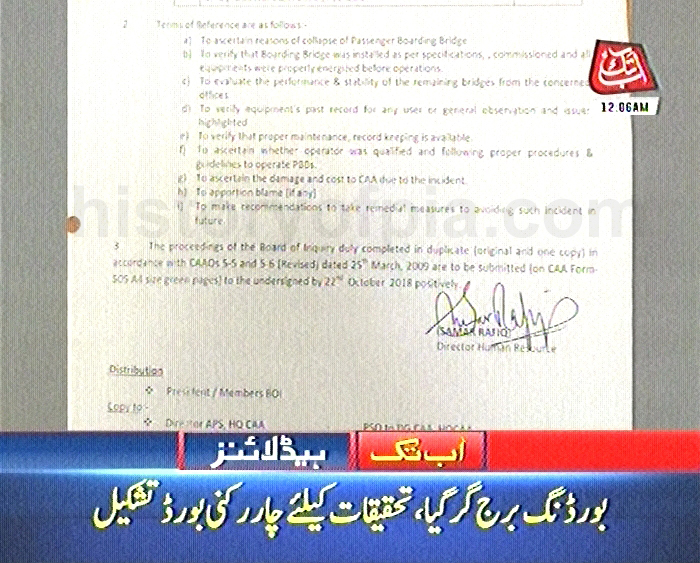 * Islamabad International Airport systems engineer has been suspended. * Two committees have been formed to investigate the incident of passenger boarding bridge crash at Islamabad Airport. * The fact-finding committee will submit its report within three days. * The high-level committee will submit its report on October 22. * Officials at all CAA airports have been directed to inspect boarding bridges and remove any technical problems (if any) in boarding bridges. Sensitive agencies have been directed to identify people who leaked photos and videos of the crashed passenger boarding bridge at Islamabad International Airport to the media. Photography and videography is prohibited in the area of the incident. 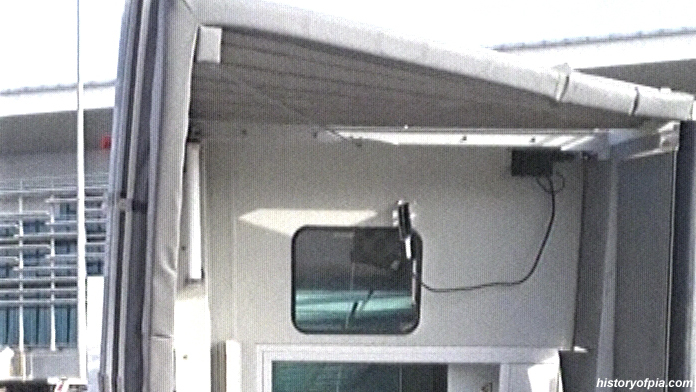 Surveillance cameras' footage will be used to identify people who took photos and made videos. Authorities want Airports Security Force (ASF) personnel to be investigated for the leaked photos that damaged reputation of the new airport. ASF is refusing to provide surveillance cameras footage. Four-member Board of Inquiry formed by Pakistan Civil Aviation Authority (CAA) to investigate the crash of passenger boarding bridge at Islamabad International Airport. To ascertain reasons for passenger boarding bridge collapse. To verify that the boarding bridge was installed as per specifications, commissioned and equipment was properly energized before operations. To evaluate the performance and stability of the remaining bridges from the concerned offices. To verify equipment's past record for any user or general observation and issues highlighted. To verify that proper maintenance, record-keeping is available. To ascertain whether operator was qualified and following proper procedures and guidelines to operate passenger boarding bridge. To ascertain the damage and cost to CAA due to the incident. To make recommendations to take remedial measures to avoid such incident in future. RAWALPINDI: Six months after the multi-billion rupees Islamabad International Airport (IIA) was made operational, a passenger boarding bridge, commonly known as aerobridge, collapsed moments after it was disconnected from a plane early on Tuesday. 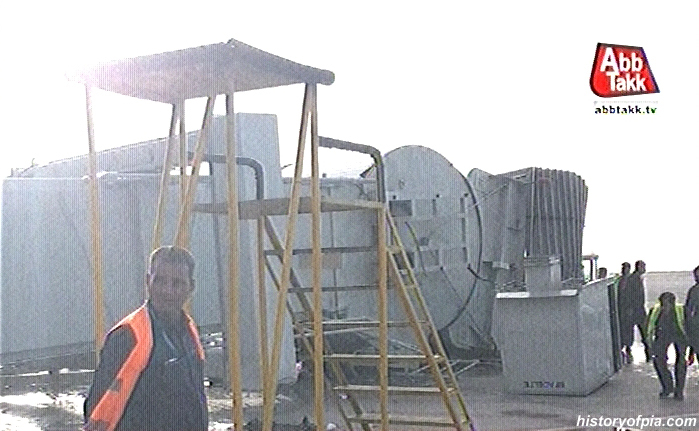 An employee of the Civil Aviation Authority (CAA) and a private loader were injured. CAA Director General Hassan Baig constituted a four-member board of inquiry to investigate the incident.The board will be headed by CAA deputy director general Syed Amir Mehboob and assisted by Sadiqur Rehman, director project Islamabad International Airport expansion project; Omaidur Rehman Abbasi, airport manager Bacha Khan International Air Port - Peshawar (BKIAP), and Kamal Khan, senior director BKIAP. 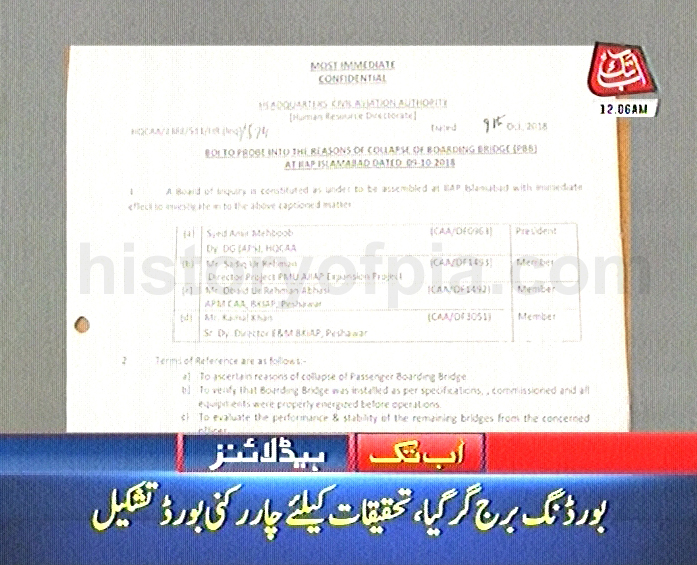 When contacted, a CAA spokesperson said the aviation authority`s chief has ordered an inquiry into the incident to ascertain the circumstances under which the bridge had collapsed. The board of inquiry has been directed to submit its report by Oct 22. The board will ascertain the cost of damage and also evaluate the performance and stability of other bridges to verify whether the bridge operator was qualified for the job. 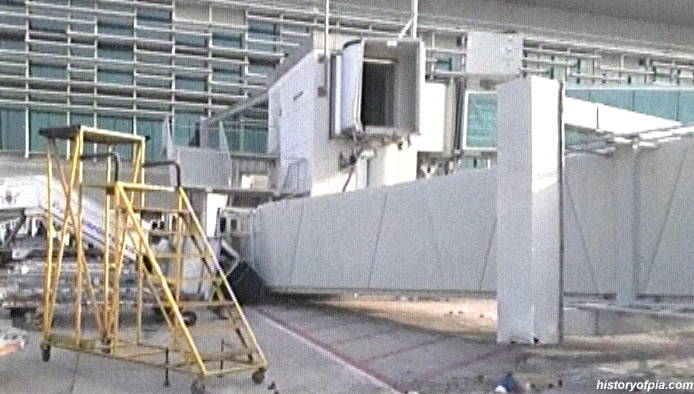 The passenger bridge No 5 (enclosed elevated passageway which is extended from airport terminal gate to an airplane) collapsed moments after it was disconnected from Gulf Airlines flight (GFA-771) that started taxing to take off at about 7:30 AM on Tuesday. A senior airport official told Dawn that Mohammad Mudassar, the bridge operator, was pulling it back after the Airbus A330 had been pushed for taxing when the bridge collapsed. No airport handling staff was under the bridge otherwise it would have been the first major disaster at the new airport. 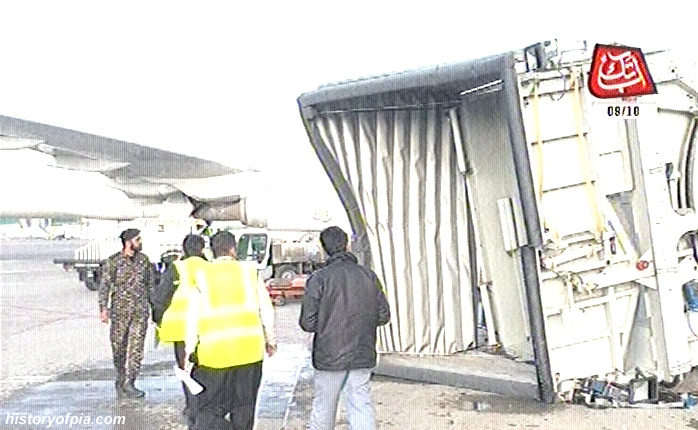 However, two luggage containers were damaged in the bridge collapse. The injured operator was taken to the trauma centre where his condition was described to be stable. The loader, identified as Munir, who sustained minor injuries, was allowed to go home after being provided first aid. Soon after the collapse of the bridge, CAA experts and engineers visited the scene, collected evidence and compiled a preliminary report. The senior official at the airport said the apparent cause of the collapse of the bridge could be loose or wobbling pins `hooks` or pins` connecting it to another portion that could not keep its balance and collapsed. He did not rule out the possibility of the pins that connected the bridge`s parts with each other having wobbled during the last night thunderstorm. The board will also verify the equipment`s past record for any use or general observation. The team will verify if proper maintenance and record keeping was available. In another incident at the airport, three workers suffered minor injuries after falling down while repairing a false ceiling at level-one of the terminal building. The injured were taken to the trauma centre where they were given first aid and sent home. According to news sources, following the boarding bridge crash incident, a number of airlines have started using apron buses for transportation of passengers between terminal building and the aircraft at Islamabad International Airport. The airlines have refused to use boarding bridge facility and want guarantees from Islamabad International Airport authorities on safe operation of boarding bridges installed at the airport. 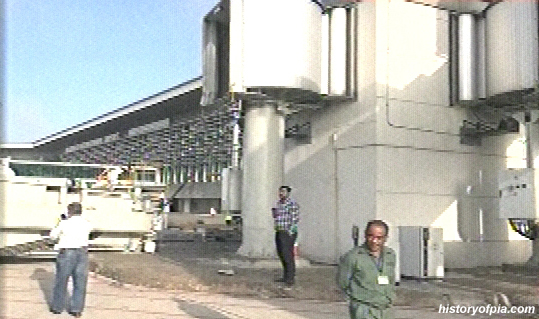 Passengers of PIA flight PK-308 from Karachi walked from the aircraft to terminal building at Islamabad Airport. An investigation team visited Islamabad International Airport today and inspected all boarding bridges installed at the airport. The team also took record of all boarding bridges. 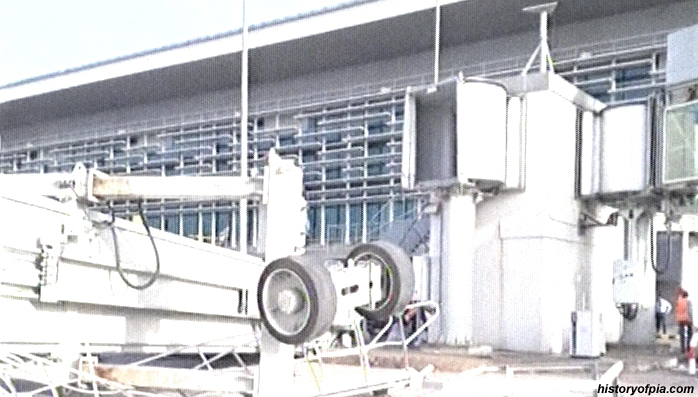 The investigation team will also hold meeting with the company that installed boarding bridges at the airport.